Cartagena attracts more visitors to Colombia than probably anywhere else, and with a stunning mixture of Caribbean beaches and arguably the country's best colonial architecture, it's not hard to see why this enchanting city captures so many visitors' hearts. Surrounded by huge stone walls lined with cannons, built to fight off the original Pirates of the Caribbean, the city's Old Town is a maze of cobbled streets, colonial mansions and shady squares. As well as all the historical sights, there are some good city beaches, with even better available just a short car journey or boat-ride out of the city itself. 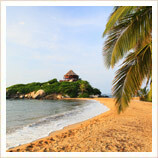 Just off the coast are the beautiful Rosario Islands, and a few days here can be the perfect way to unwind at the end of a holiday in Colombia. After spending a couple of days in Cartagena itself, you could also enjoy a couple of days staying out on the Rosario Islands just off the coast - there are regular boats to and from the islands, and it's a lovely way of getting away from it all. 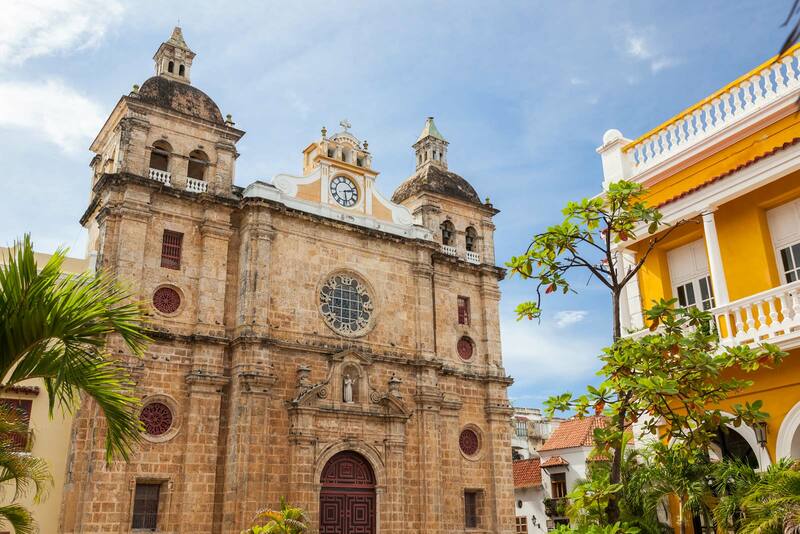 Walking through Cartagena’s narrow and winding streets it’s easy to understand why the city is listed as a UNESCO World Heritage Sites: exploring its streets is an experience that awakens all five senses. The rhythms of cumbia and mapalé, the flavours of the Caribbean, the juxtaposed architecture and the warm sea breeze make Cartagena a unique place to visit. Founded in 1533 by the Spanish conquistador Don Pedro de Heredia, the city was named “Cartagena de Poniente” to distinguish it from Spain’s “Cartagena de Levante”. It became known as “Cartagena de Indias” to distinguish it from Cartagena in Spain and rapidly became the gem in the Spanish Crown’s territories. Around the Old Town, the largest fortifications in South America were built to protect it from continual attack from (largely British!) 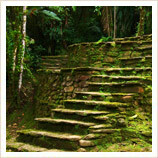 pirates and buccaneers, and a walk around the cannon-lined walls and to the Castillo San Felipe, is highly recommended. The architecture and atmosphere of the Old Town today makes it a beautiful and historic place to visit, so we’d really suggest a minimum of two days to let it all soak in. Quite apart from organised tours of Cartagena's Walled city, from shopping and sightseeing, to carriage rides and cocktails, there are so many things to do in Cartagena's Old Town - why rush it? There are some decent enough city beaches in Cartagena, but to really enjoy the Caribbean coast you need to head out into the ocean. 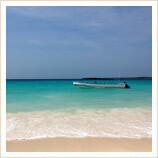 Any guide to Cartagena worth its salt will direct you to the beautiful Rosario Islands, whose outstanding beaches are located just 45 minutes away by boat. You can visit the islands on a day tour from Cartagena, or opt to stay for a few days in one of the many small hotels on these tiny islands. 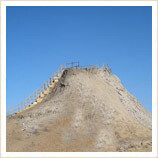 One of the quirkier tours in Cartagena is to take a trip out to visit the weird Totumo mud volcano. At Totumo, a cone of rock rises about 50 feet in the air like a miniature volcano, and a wooden staircase has been built up the side. When you get to the top you can see that instead of lava, the cone is filled with warm... mud! This is your cue to dive in and float in the supposedly healing liquid mud - so long as you're already in your swimming clothes, of course... The density of the mud means that you can float in it, which is a bizarre sensation, and there are even attendants on hand offering massages and help washing the mud off afterwards. 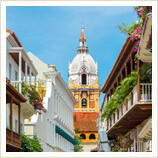 Probably not what you expected on your visit to Cartagena, but why not give it a go? As a popular destination for American visitors, Cartagena is actually very well-served with international flights to the US: Miami, New York and Fort Lauderdale are all served on an almost daily basis. However, because most of these flights are on US budget carriers, they are of limited use to passengers from Europe. As a result, most UK visitors are likely to arrive in Cartagena from another city in Colombia: there are regular flights to Cartagena from most destinations in Colombia, including Bogota, Medellin, Pereira in the Coffee Triangle, and Cali. And brilliantly, there are now also four direct weekly flights a week to Lima in Peru. Of course, as a popular destination on Caribbean cruises, you might even begin your holiday in Cartagena the old-fashioned way: by ship! Public transport within Cartagena consists entirely of buses and the network can be difficult to navigate if you're not familiar with it. Taxis are plentiful but beware that they don't have meters so you will need to agree the fare before setting off - and of course, there is no motor traffic allowed within the walls after 6pm. Cartagena has a tropical climate, in which temperatures remain pretty constant throughout the year (the average high hovers around 31°C) but in which there is a pronounced difference between wet and dry seasons. It's fairly wet from May through August, but then it gets a little drier in September before really throwing it down in October. In fact, in general a little rain is no bad thing because it reduces the humidity, but probably October isn't the best month for a holiday in Cartagena. All our holidays to Colombia are 100% tailormade, so if you'd like to customise any of the tours of Cartagena you see here, or just plan a trip completely from scratch then get in touch and let us know - we'll be delighted to help you plan your perfect holiday in Cartagena!